23,237 new energy issues brought by clients through the 61 Citizens Advice Bureaux across Scotland, an increase of 5% from 2014-15. 4,210 calls from Scotland to the Citizens Advice Consumer Service-a decrease of 12% from 2014-15. 1,163 vulnerable consumers in Scotland supported by the Extra Help Unit, almost identical to the number in 2014-15. 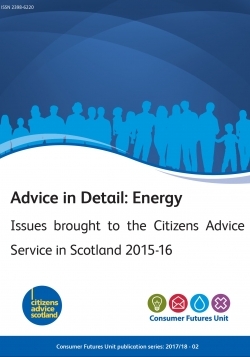 1) Our evidence shows that billing and metering issues are still extremely prevalent and continue to be the most common energy issue reported across the Citizens Advice Service in Scotland. There are clear standards which gas and electricity suppliers are required to meet, but the data shows that problems remain and cause significant hardship for consumers, particularly for those on low or fixed incomes. 2) Our cases also continue to show that customer service standards and complaints procedures are not sufficient or delivered consistently. Customers can be faced with long and multiple telephone calls to call centres and can be given advice that is of varying quality and can be contradictory. 3) Evidence from across the service shows that management of energy debt still needs to improve. Energy suppliers have a role in managing consumers’ debt responsibly and are subject to licence requirements to take ability to pay into account when setting debt repayment rates. Cases continue to show that this is not carried out consistently by suppliers.